HINATUAN, Surigao del Sur—Hidden behind towering rocky mountains near the Pacific Ocean in this sleepy town, a mystical river continues to enchant residents and tourists. Accessible through a dirt road, tourists usually doubt if it is worth it to travel kilometers from the city and risk taking the road less traveled. But as the dust settles after the retrofitted motorcycle “habal-habal” halts at a relatively unadorned gate, visitors will be quickly transported to a mystical world called the Enchanted River. Palm trees and indigenous flora surround a placid river with clear bluish water. On one side, a deep chasm, believed to be at least 80 feet deep, bids reverence and invites those who are bold to explore its complicated network of underwater fissures. And as the clock hits noon, the Hinatuan Hymn is played over loud speakers. Like an ancient ritual, people who are swimming immediately paddle back to land while the fish assemble near the riverbank. Felecisimo Baguasan, caretaker and lifeguard at the Enchanted River, starts throwing cooked rice and minced octopus meat in the water, which the fish start to gobble up like there is no tomorrow. “I have been feeding these fish like my children for more than three years now. These fish are important,” Baguasan said. 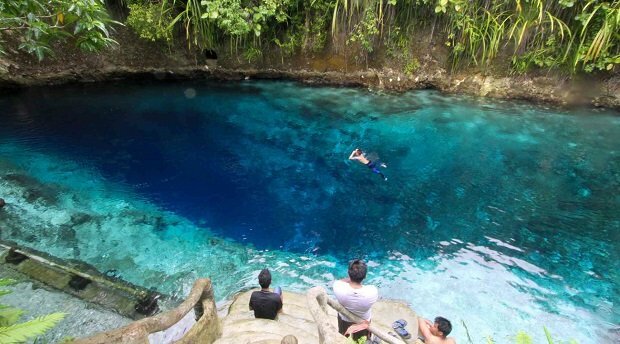 Baguasan said the one thing different in Enchanted River was that it remained the same through the years. “It almost never changed. But several things have also progressed, like the cottages and a portion of the road going here that is already being cemented,” Baguasan said. He said that when they were still young, they listened to tales about fairies and mermaids and their supposed roles in protecting the river and giving it its mystical color. “Different generations and witnesses have different versions of their stories. But what we are sure about is that spirits live here,” Baguasan said. Baguasan added that there were many anecdotes wherein some visitors felt “unexplainable” body pains, boils or itches after taking a bath in the river. “Some, most especially those who are irreverent and noisy, will acquire afflictions that cannot be explained,” Baguasan said. However, Baguasan said, tourists must not be afraid of the mystical powers of the river, adding that they should only respect Mother Nature and the spirits around it. Several professional divers have attempted to explore the brackish waters and the underwater compartments in the river. “Many foreigners attempted to reach the bottom but until today, no one has ever reached it,” Baguasan said. The Department of Tourism and the local government of Hinatuan are trying to bring in more development to the area to attract more domestic and international tourists to be enchanted by the river. Cottages are already built while local fishermen sell fresh fish, crabs and lobsters, which they are more than willing to cook for visitors. For children, a portion of the river was transformed into a kiddie pool. The entrance fee is P30 while vests can be rented for P100 each. However, Baguasan has an appeal to the government, residents and tourists. “To preserve the mystical beauty of the Enchanted River, we must take care of the environment. Massive logging must be stopped because this will destroy everything,” Baguasan said. Logging and mining operations, which are primarily blamed for successive disasters in Mindanao, still continue in the province of Surigao del Sur. Baguasan said the river was able to withstand the devastation of typhoons, but that he was not sure if the river would continue to enchant people if these destructive and extractive activities continued.